Products and further friendly advice available at Mona Vale and Avalon Johnson Brothers Mitre 10. How to winter proof your lawn! the biggest barriers to a healthy spring/summer lawn. Most of the grass varieties used around the Pittwater area are warm weather grasses and hence do not fare well in the depths of winter. Aeration of lawns is vital, especially over high traffic areas of lawn. By creating small holes in the soil oxygen and water are able to better penetrate and operate in the soil and aeration also breaks up compacted soil that can make growth of the lawn difficult. Aeration is simple and should be done prior to fertilising so that the nutrients have the best chance of reaching the soil and roots of the grass. Simply stick a garden fork into the soil to a depth half the length of the prongs. Give the fork a gentle wiggle and pull it back out working your way across the lawn at a spacing equivalent to that of the prongs. Now is the time to watch for signs of hunger in your lawn as sending it into the winter season weak and hungry is a sure way to find a patchy spring growth. Colour loss, twisting leaves and abnormal sprouting of seed heads are the ones to watch for. Fertilisers contain three essential nutrients; Nitrogen, Phosphorus and Potassium. -Potassium; strengthens the roots of a plant and helps protect it against temperature extremes. A fertiliser that is high in both nitrogen and potassium will provide much needed nutrients to your grass and in turn strengthen it against the winter cold and low light levels. especially good for you lawn. 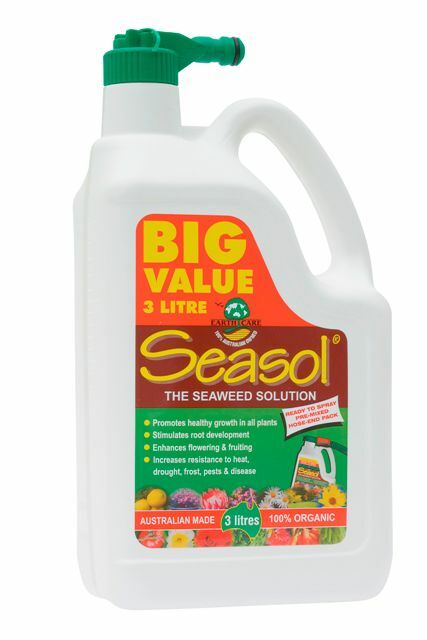 Johnson Bros have a special on Seasol 3L concentrate for March only at $7.95 (Down from $14.24). Get this done now and you will set yourself up for a healthy, strong, and even lawn coming into spring.